San Francisco studio fuseproject have unveiled the OLPC XO-3, a tablet computer for the next generation of the One Laptop Per Child project to distribute robust, cheap, self-powered computers for education in the developing world. 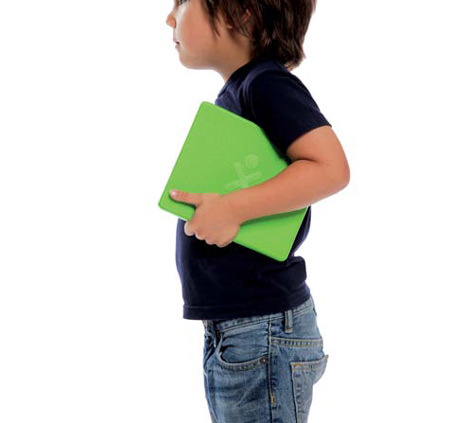 Designed in collaboration with One Laptop Per Child founder Nicholas Negroponte, the tablet has a green rubber border and removable cover. This cover can house a solar cell to charge internal batteries. The power switch, cable ports and speakers are arranged along one edge and there's a rear-facing camera. The original XO laptop won the Index Awards in 2007 and the Brit Insurance Design of the Year award in 2008. See initial designs for the XO-3 from 2009 in our earlier story and more stories about fuseproject here. “After 6 years of design development with Nicholas Negroponte and the non-profit organization he founded, One Laptop Per Child, I am incredibly excited to share the next generation XO-­‐3 tablet. More than 2.4 million children in 25 countries received the original XO Laptop, and these kids have been our inspiration to create the next generation of this educational tool. One Laptop Per Child is a technology story about how to provide low-­‐cost educational tools to millions of children. For those children, and for us, it is also a creative story about how to design specifically for young students. Every decision made by the OLPC engineering team and the design team at fuse project has been about adapting technology to children’s needs at a cost that makes the tablet affordable for developing countries. The first impression of the XO-­‐3 is its extreme simplicity. The focus is on the screen, while the surrounding green rubber border provides a safe tactile grip for children’s hands. The back surface has a bumpy texture and integrates a rear-­‐facing camera. The connectors, power switch and speakers are arranged on the bottom edge, facing the user. The XO-­‐3 tablet uses similar ruggedizing strategies as the original XO laptop: rubber protection, anti-­‐scratch grip textures, and robust construction. The XO-­‐3 takes this protection further by creating an elastomer removable cover, which is flipped from screen cover to back cover. The cover’s arced front surface allows access to ports and buttons, and shields them during transportation to further preserve the hardware. Additionally, the solar cover option can house a solar panel combined with internal batteries for outdoor or indoor charging. Our approach has been to minimize complexity, while delivering a high quality, and a heightened touch feel. There is playfulness in the way one can adapt the cover to different needs, while each design detail and material is chosen to deliver maximum value.” Yves Behar, fuseproject founder and OLPC Chief Designer. One Laptop per Child is a non-­‐profit organisation whose mission is to provide every child in the world access to new channels of learning, sharing and self-­‐expression. In partnership with the public and private sectors and non-­‐governmental organisations and supported by comprehensive implementation and pedagogical services, OLPC seeks to provide each child with a rugged, low-­‐cost, low-­‐power connected laptop that empowers individual learning and growth. is a designer, entrepreneur, and sustainability advocate. He is the founder of fuse project, the San Francisco and New York based design and branding firm he established in 1999. He is also Chief Creative Officer at Jawbone where his products, brand and communications guidance has built the company into a leader in wearable and audio consumer electronics. His collaborations with renowned partners such as Herman Miller, Jawbone, GE, Puma, Canal+, MINI, Samsung, Issey Miyake, Prada and many others have received international acclaim. Yves Béhar believes that design should be a force for positive social and environmental change. He is well known for his humanitarian work on projects such as the One Laptop Per Child where he serves as chief designer since 2006, and See Better to Learn Better. For each of these he was honored with the INDEX award, making him the only designer to have received the award twice. Béhar's works are included in the permanent collections of museums worldwide, including the Museum of Modern Art, San Francisco Museum of Modern Art, Centre Pompidou and the Art Institute of Chicago. Béharis a frequent speaker on design, sustainability and business topics; he has given talks atTED, the World Economic Forum in Davos, and the Clinton Global Initiative. Béhar is currently the artist trustee of the Board of Directors of the San Francisco Museum of Modern Art, has garnered over 200 awards, and was named a Top 25 Visionary by TIME Magazine.